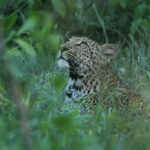 It’s always amazing to be able to see the Big 5 especially the Leopard, as it is the most difficult to find. They are so well camouflaged and very elusive animals. With their solitary habits, it just makes it more difficult as they spend most of their time alone. Each Leopard has their own territory and they leave scratches on trees, urine scent marks etc. to warn other leopards to stay away! 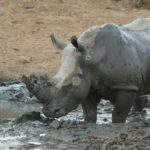 When they want to mate, males and females will cross territories. It was another beautiful day as we set off from Kapama Buffalo Camp. 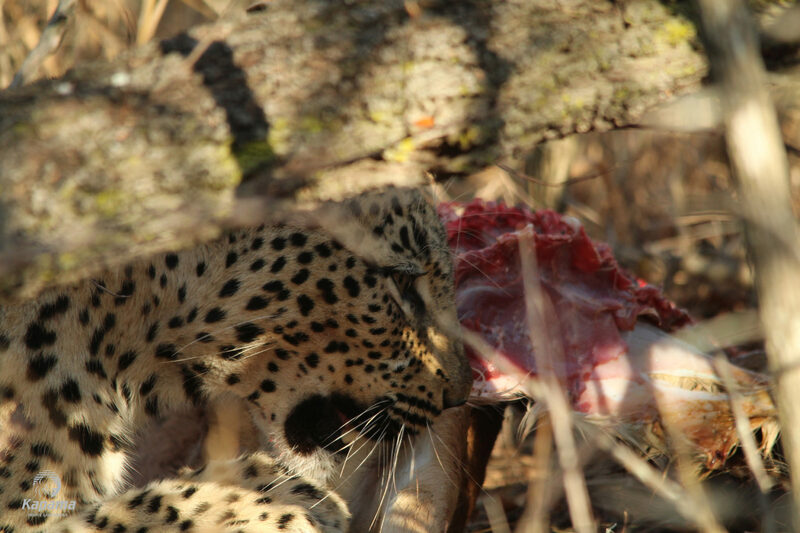 My guests and I were fortunate as, on this particular game drive, we were thrilled to be able to find a beautiful young female Leopard feasting on an Impala kill. However, the finding part wasn’t that easy for us. While on a drive we manage to find fresh leopard tracks. 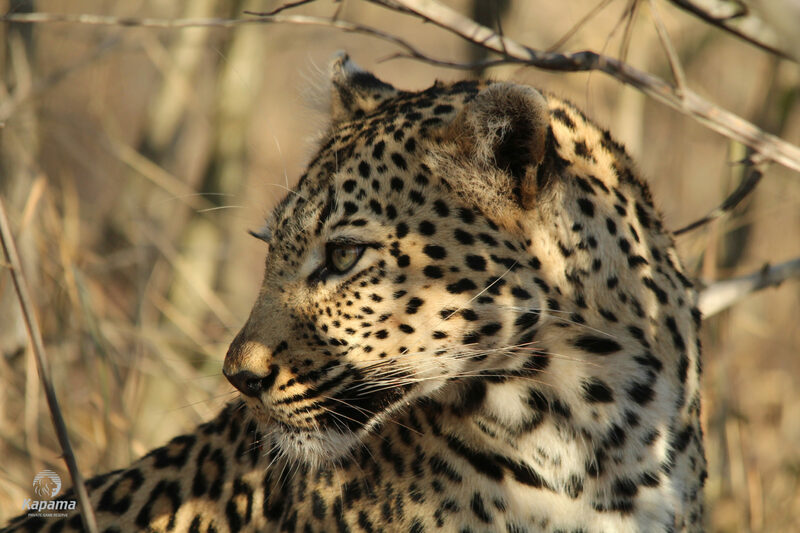 My guests mentioned that of the animals, and out of the Big 5, the Leopard would definitely be the highest on their bucket list. 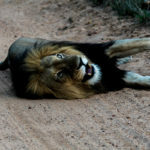 Sonny boy, my tracker picked up on some fresh tracks early in the drive which certainly caused for some excitement. Up and down we followed the Leopard prints, but it would seem that we had our work cut out for us. The tracking of the fresh “spoor” took us about 2h. Eventually, we managed to find her, together with a recent kill that she had just started to eat. Sonny Boy and I deliberated for a bit and we both concurred that we probably missed the hunt by just a couple of minutes. 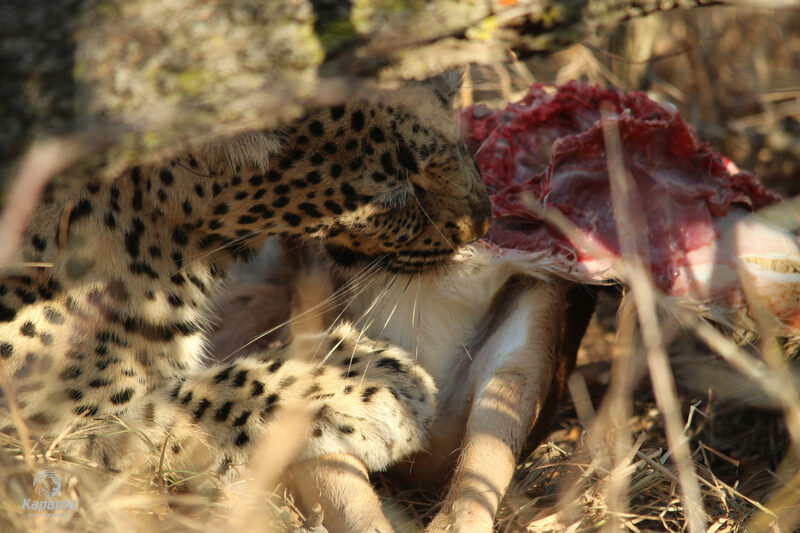 The diet of a Leopard is made up of small hoofstock such as gazelle, impala, wildebeest etc. On occasion, they may also hunt monkeys, rodents and birds. 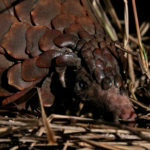 They often bring their prey up into the branches of a tree to eat it and protect it from other predators like Lion and scavengers like Hyenas. 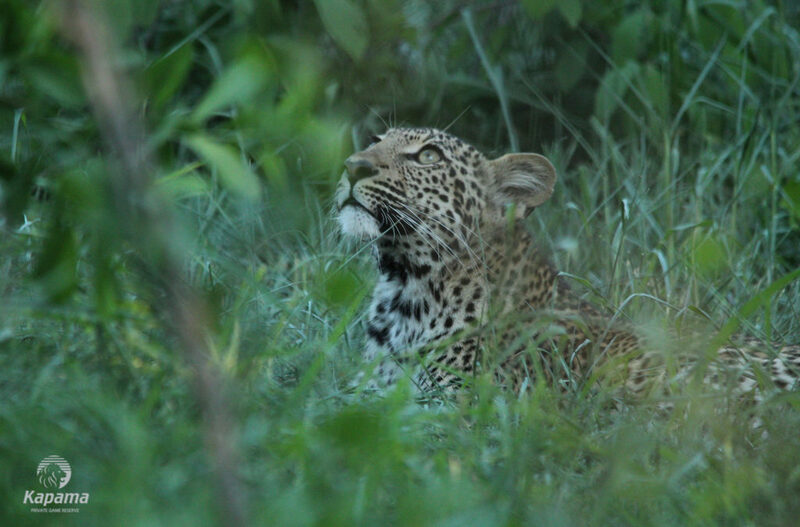 However, on this occasion, the female Leopard was lying down under a tree and it was rather difficult to see her. We all watched her for a few moments so excited that the tracks we picked up on earlier together with the up and down searching revealed such a terrific sighting. As we watched, she regularly looked up from her prize to see if there was something in the vicinity that wanted to steal her meal. Every time she did this, it gave us the perfect photo opportunity. You could even hear her cutting through the skin with her incisor teeth. Besides the Lion, the Leopard is the next biggest African cat, with an average mass of 60 to 70kg. The Leopard’s hunting technique is to either ambush or stalk its prey, in either instance it tries to get as close as possible to its target. 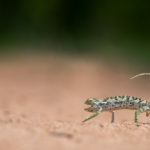 It then makes a brief and explosive charge up to 60km/h, pouncing on the prey with a bite to the neck. This would have been the fate of the Impala she was eating. 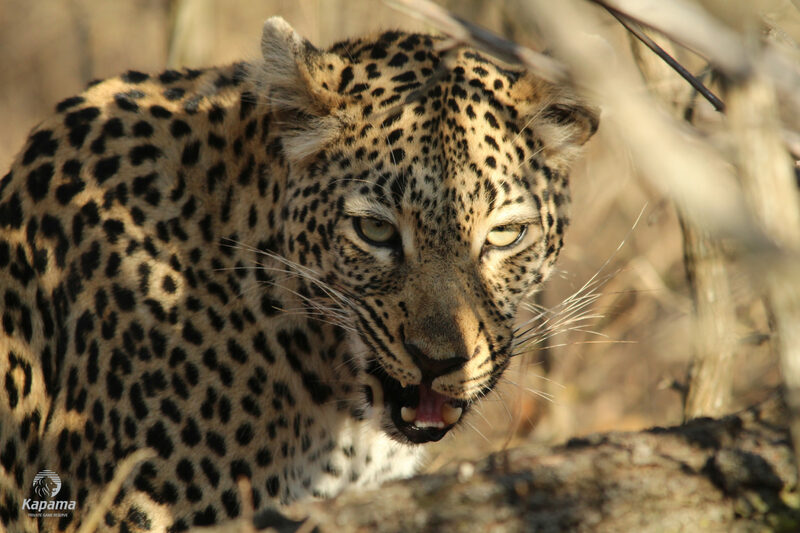 Leopards normally drag the kill up a tree, to protect it from scavengers like Hyena or even Lion. However, it seemed she was comfortable enough to eat it on the ground and not move it anywhere. We left her after a good while not wanting to overstay our welcome. We continued on with our drive and slowly made our way back to camp. The next morning game drive we decided to do a quick drive-by to see if she was still around. When we got there she had moved the impala kill up into a tree. It was a very small tree and as we got there, we actually found her moving it back down again. The tree was merely a way to keep it safe during the night but not nearly big enough for her to keep her balance and eat at the same time. It was just great to be able to see the Leopard, not only but twice. The sightings were not just about getting a photo of a Leopard but actually allowed us to spend time with her, observing her behaviour and experiencing raw nature. What a treat, not just for my guests, but certainly for myself and Sonny Boy as well! I don’t believe it, that leopard was just waiting for us to leave the camp. He/she is absolutely beautiful. Thanks for the message and you are right, so beautiful.